An easy and delicious ham recipe that's unforgettable in flavor! 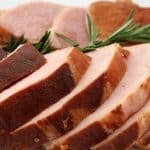 If ham is too large, cut ham meat off bone into large chunks and place in Instant Pot. Save bone for another recipe (like baby lima beans or soup). Add remaining ingredients and set manual time for 10 minutes at high pressure. After cooking is complete, allow pressure to release naturally. Remove and thickly slice meat.